Here’s what it is, where to get it, and even how to make your own ‘goth’ ice cream. Black ice cream is not a new phenomenon, having made a similar surge in popularity last summer. It’s generally an ice cream made with activated charcoal. While some may recognize that ingredient for its detox abilities used in hospitals and emergency rooms, it’s not exactly the health food that some places market it to be. Others might be familiar with charcoal’s popularity in beauty products like face masks and toothpastes. Did vanilla ice cream used to be black? Though there was a rumor going around that vanilla ice cream was originally black but had its color changed for racist reasons, the truth is that default vanilla has always been white. Even though it looks intense, the flavor of black ice cream is actually fairly mild. BuzzFeed’s Chelsea Marshall ventured to Morgenstern’s in NYC last summer to test the black ice cream there, and she reported back: “The coconut was pretty mild, and I found the overall flavor refreshing.” Though it gets its rich color from activated charcoal, it doesn’t carry any flavor of those familiar charcoal briquettes you’d throw on the barbecue. 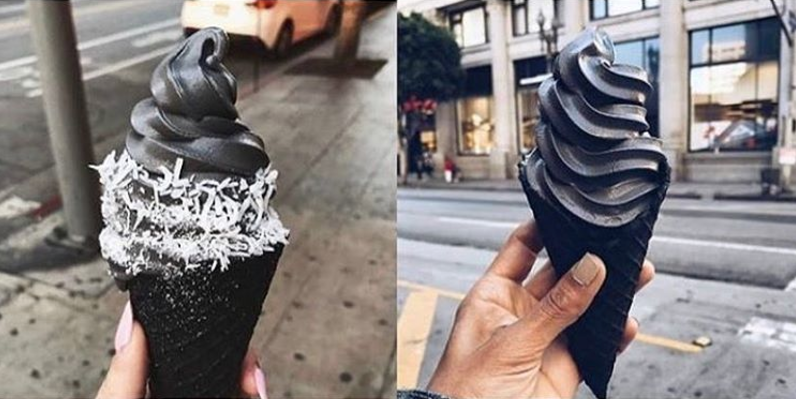 Where can I get some black ice cream? Perhaps the most popular iteration making the rounds in 2017 is the black soft serve from Los Angeles’ Little Damage Ice Cream Shop. It’s also been spotted at Tim’n’Tim in Moscow and a food truck in the U.K.
How can I make black ice cream? On the good chance you’re nowhere near a spot that offers the gothic treat and want to get in on the fun, it’s definitely possible to make your own. This version, from Spoon University, doesn’t even require an ice cream machine—though you will, of course, need to track down the signature ingredient: activated charcoal. With the addition of lemon juice, sweetened condensed milk, and a bit of sour cream, it’s definitely possible that you’ll get a zestier flavor with the homemade edition too.